The Blues & BBQ Charity Event to raise money for Wreaths Across America was a phenomenal success and the Committee wanted to thank everyone who contributed and everyone who worked so hard to make this happen!!! 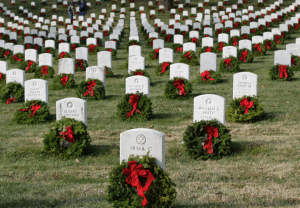 We raised $3,525.00 and that number will be matched by Greg & Yvonne Mixon so our grand total to give to Wreaths Across America is…………..
Special thanks and shout outs to……………. Everyone who contributed, donated or purchased a ticket! Greg & Yvonne for their GENEROUS match! Russ & Mae O’Neil who smoked & sliced 205 POUNDS of pork butts!! Paul Valgas who did an AMAZING job of emceeing!! Lynn Liedel & June Chapin for creating and managing all raffle ticket items – raffle sales equaled ½ our profits!! Everyone who served on the committee because each one of you stepped up and worked together for this worthy cause. The Kitchen, Activities & Maintenance Staff of Paradise Oaks; we thank you so very much for your support while we worked on this benefit – we understand you have lots of other jobs too!